Maritime and Coastguard Agency - they are responsible for UK maritime safety policy and for co-ordinating search and rescue within UK waters. 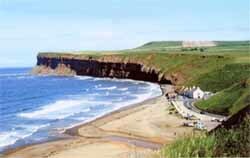 www.seasideawards.org.uk - guide to which beaches in the UK have won awards for safety and cleanliness etc. Includes details of Blue Flag awards. Organised on a regional basis. www.seabritain2005.com - This is a very interesting site that is about the festival that is taking place in 2005 to celebrate Britain's involvement with the sea over the past 200 years. The highlight of this will be the celebration of the bi-centenary of the Battle of Trafalgar in October next year. www.worldheritagecoast.net - Guide to the Devon and Dorset coast that has been awarded World Heritage status by UNESCO. The coast area has a history stretching back over 185 million years and offers stunning scenery to rival any in the world. www.festivalofthesea.co.uk - Part of the SeaBritain2005 celebrations. Based around the Portsmouth area from 30 June to 3 July 2005.
www.visitsouthwest.co.uk - The official (Tourist Board) guide to the Southwest region. www.meto.gov.uk - Check out the weather where ever your planning to go - one things for certain in the UK - whatever the weather is now it will change! www.meto.gov.uk/leisure/shiparea. - Want to know what the shipping forecast means - check it out here. Also useful if your planning to take a ferry - will it be rough or calm? www.pembrokeshirecoast.org.uk - The website for Pembrokeshire Coast National Park, the UK's only 'coastal' national park. The National Trust - The main website for The National Trust which owns and maintains large sections of the UK coastline. They also have holiday cottages for hire. www.nts.org.uk - This is the home of The National Trust for Scotland which has a similar remit to the English organisation. www.travellinksdirectory.com - Directory of travel related web sites with links to airlines, hotels, vacations, destination guides, travel agents, agencies and travel information. www.trektheuk.com - Travel UK - UK Travel & Tourist Information - Possibly the best UK Travel Guide on the Web @ TREKtheUK.com - Sharing places to go & things to do in the United Kingdom - England, Scotland, Wales & Northern Ireland; we offer everything you need to know about UK travel & Tourist Information. www.travel-library.com - Travel Library - Browse travelogues, independent hotel reviews, free holiday and airport guides plus much more! www.britinfo.net/travel/index.htm - UK Travel Agents and Tour Operators; package holidays and tourist packages. GreatVille Travel Directory - submit your travel/vacation site to this comprehensive Internet travel directory. www.hoteldiscountslondon.co.uk - Cheap London hotels for vacations offering discount rates in fine accommodation - weekend-breaks, theatre breaks and trips to London England. Travel :: Resources Online - Your online travel resource centre.